Deeper Shades Recordings 40th release is going to make you smile and groove. Listen & download this two tracker by DJ Funky T from South Africa for some smooth shuffles, bouncy basslines and favorite vocal snippets which will unleash the bottom half of your body without you noticing! Listen and let it happen ..
Alton Miller "Nice one !!!" Sebastian Davidson (Nightbird Music) "Killer tune!" Joey Silvero (Distant People) "Nice spacey vibe, hypnotic vocal sample, creeps up on you, great for moving the floors!" Trancemicsoul "Dope release! I will support… "
Kiko Navarro "Feeling She Got It Bad, will play it!" Fistaz Mixwell "Love it. Blazing it this weekend!" Deli-G "Really Feeling The "She Got It Bad" Joint will put the show playlist on this weekend show"
Oscar P "In the Bag. Very Nice"
Rancido "She Got It Bad is super dope!! ..well def play this out"
Booker T "Nice soulful track will support gonna play this on my radio show tomorrow"
DJ Minx "She Got is bad - hot!" Moodymanc "Liking shining diamonds here thanks…"
Souldynamic "Dope deep house EP!! the two tracks are so hot! We'll play for sure!" Sunshine Jones (Dubtribe) "Love! Thank you." Mike Fossati (Spirit Of House) "Two masterly crafted deep house gem guaranteed to put a spell on you…"
Sean Smith (Smooth Agent Records) "Shining Diamonds" is hot!! Will be playing this out. Full support!" Rafael Moraes (Nomumbah) "Feeling the deep sounds of "Shining Diamonds". Nice one!" Nick Holder "Im digging both cuts, nice and deep!" Just Mo (Yfm) "Big up to Funky-T ...great e.p, love the deepness!!" Eman "Big up to my man Funky T From Your Liberate Fam.... Full Support.... Lars Love your Wife's Artwork…"
Trickski "Good stuff once again. I have really been digging DSOH lately thx!" Groove Assassin "Nice vibes !" Fabio Genito "very cool. Will definitely support this"
Jonathan Backelie "Lovely! Just up my alley. Will support and play already tonight!" Dr. Bob Jones "Nice production on both cuts, with She Got It Bad just having the edge for me. Will support, no problem. THANK U for the music & stay blessed Dr Bob J"
Minus 8 "very good idea of including that Rihanna sample. Nice one!" Thatmanmonkz "Lovely, warm, high quality stuff from Funky T and the DSOH crew... Though I would expect nothing less! Can definitely see me dropping 'She Got It Bad', will support"
Boddhi Satva "DSOH always delivers. Much Support." 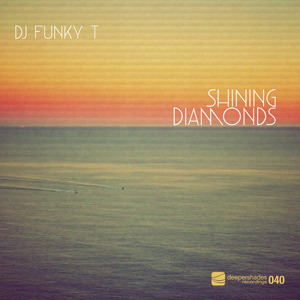 DJ Funky T "Shining Diamonds"